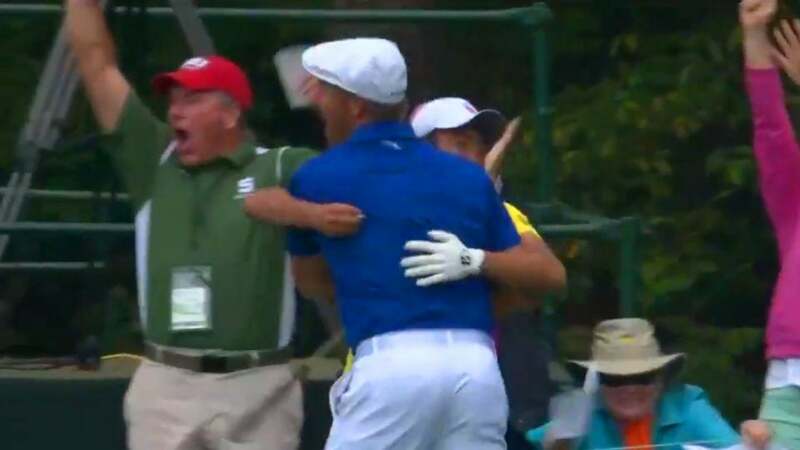 Bryson DeChambeau celebrates a hole-in-one at 16 during the final round of the 2019 Masters. By the time he reached the par-3 16th hole during the final round of the Masters, Bryson DeChambeau no longer had a chance to win his first major. But there was one golfing feat he had never accomplished that he could still check off his list: a hole-in-one. DeChambeau started his round on the 10th hole on Sunday, and it would only take seven holes to make a memory that would last a lifetime. DeChambeau arrived at 16 two over on the day and even for the tournament. With a 7-iron, he stuck his ball onto the ridge above and to the right of the Sunday hole location. All he had to do from there was watch as it trickled down the slope and curved into the hole. Incredibly, it was the very first hole-in-one of Bryson’s life, as Jim Nantz announced to the world on the broadcast. That explains Bryson’s jubilant celebration on the 16th tee. With the face, DeChambeau moved to even par on the day, and two under for the tournament. Despite the turnaround, he’s likely way too far back to challenge Francesco Molinari and Tiger Woods for the 2019 Masters title.